BEIJING, April 2 (Xinhua) -- China suspended tariff concessions on 128 items of U.S. products including pork and fruits starting Monday, according to the Ministry of Finance. The Customs Tariff Commission of the State Council has decided to impose a tariff of 15 percent on 120 items of products imported from the United States including fruits and related products, and a tariff of 25 percent on eight items of imports including pork and related products from the country, according to a statement posted on the ministry website. The statement said it was a countermeasure in response to a previous U.S. move to slap tariffs on steel and aluminum imports. 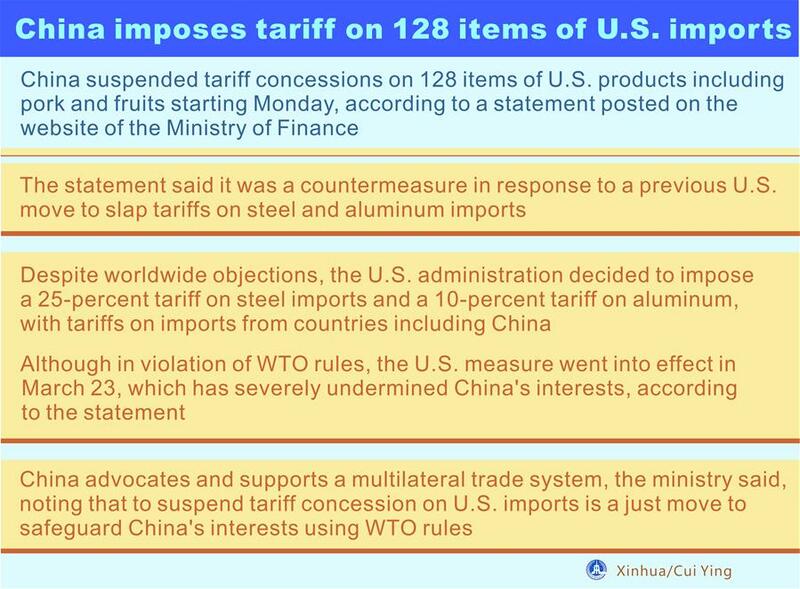 Despite worldwide objections, the U.S. administration decided to impose a 25-percent tariff on steel imports and a 10-percent tariff on aluminum, with tariffs on imports from countries including China. Although in violation of WTO rules, the U.S. measure went into effect in March 23, which has severely undermined China's interests, according to the statement. China advocates and supports a multilateral trade system, the ministry said, noting that to suspend tariff concession on U.S. imports is a just move to safeguard China's interests using WTO rules.